Located entirely off the grid, the Cliffhouse Cabin in Smithville offers unparalleled views of Broken Bow Lake in southeast Oklahoma. Sometimes you just want to get away from it all and put some space - or even a whole mountain - between you and the outside world. When you’re looking for extreme seclusion, let these off the grid getaways guide you to distant destinations across Oklahoma. Pack your bags and driving gloves for a stay at The Cliffhouse in southeast Oklahoma. This remote locale is entirely off the grid. Not only does the cabin generate its own power and water, but it’s also located on a mountain surrounded by 40 acres of heavily-wooded forest. The route to the cabin takes you through US Forest Service roads best suited to vehicles with a bit of clearance. The first two miles are relatively easy at 25 mph, but the remaining three miles require a bit of driving skill. Some areas of gravel road will have up to 12 percent grades, and you’ll also be driving through four to five small creeks, although the water is rarely more than four inches deep. This peaceful retreat can sleep up to five people and offers incredible panoramic views of Broken Bow Lake from a 600 sq ft deck. Guests will find all the comforts of home with an updated kitchen, full bath and all linens provided. Relax in southwestern elegance in the heart of the Tabletop Mountains of Great Plains Country. This splendid stucco casita, offered by Hidden Hills Hideaways in Foster, is only accessible by higher clearance vehicles. Upon arrival, you’ll be charmed by the semi-enclosed native rock courtyard complete with fire pit for those crisp evenings. Thanks to discretely concealed solar panels and a small wind turbine, this property offers environmentally-friendly electric and evaporative cooling. As an added bonus, there are no unsightly power lines to obscure the sweeping views from your cabin. Inside, guests will find a queen-sized bed, claw-foot slipper tub, wood-burning fireplace and fully-furnished kitchen stocked with a gourmet breakfast prior to your arrival. Not only does the cabin generate its own power and water, but it’s also located on a mountain surrounded by 40 acres of heavily-wooded forest. Kenton, Oklahoma is about as remote as you can get. With a population of 17, this panhandle community offers a couple of lodging properties highlighting the Western way of life and subtle natural beauty of the area. The small town is actually so far west that it’s the only place in the state that runs on Mountain Standard Time. Book a stay at Hitching Post Lodging & Ranch, Hoot Owl Ranch, Black Mesa Bed & Breakfast or Mesa Valley Guesthouse for a chance to get away from it all. You’ll need to bring your own food and gas, because there’s not a grocery store or gas station within 40 miles. However, with one stargazing trip to Black Mesa State Park - home to Oklahoma’s highest point - you’ll soon realize that the peace and solitude are worth giving up big city conveniences. Located in south-central Oklahoma, Roadrunner Hideaway is so secluded it comes with its own personal golf cart. Managed by the top-notch Shiloh Morning Inn in Ardmore, this two-person cottage comes with a plush king-sized bed, spa shower, hot tub, private deck and more. It is set apart from the other cottages while being close enough to the main house that you can hop on the golf cart and enjoy a delicious breakfast each morning. The inn and cottages sit on 73 secluded acres just 10 minutes from I-35 in Ardmore, which is halfway between Oklahoma City and Dallas. When you’re ready to venture out, Lake Murray State Park and the Chickasaw National Recreation Area are just a short drive away. Head up, up and away from the daily grind with a stay at Kiamichi Mountain Villa. This remote villa is actually located on its own mountaintop surrounded by over 10 acres of dense forest. With four bedrooms, this hidden hideaway is big enough to sleep eight adults, but smaller parties will also feel right at home. Amenities include a gas fireplace, full kitchen, wireless internet, HDTV with satellite and two outdoor fire pits. 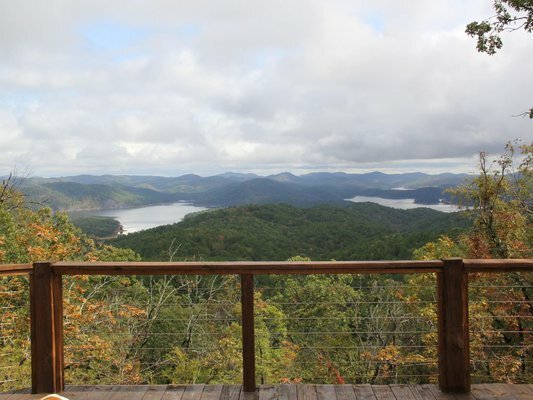 Enjoy a spectacular view of the Kiamichi Mountain Range from the deck or reconnect with nature with a hike in the Ouachita National Forest surrounding the property. This cabin is located in McCurtain County, a beautiful area known for its plentiful outdoor activities. Head out for a float along the Upper Mountain Fork River or visit Beavers Bend State Park to fish, picnic or go on a horseback ride.